Copenhagen may be the political and economic centre of Denmark, but it's as far east as you can go in	the country before crossing the Kattegat to Sweden. 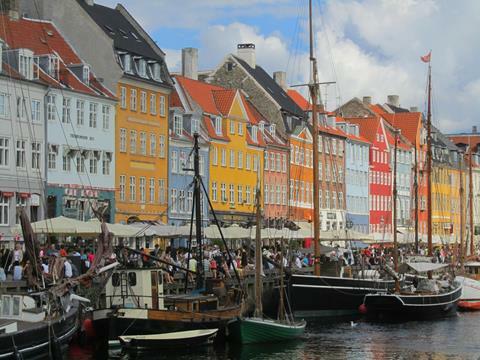 One of the four Scandinavian capitals, Copenhagen	started as a Viking village before becoming a powerful regional centre with its well fortified	waterfront in the 1600s. 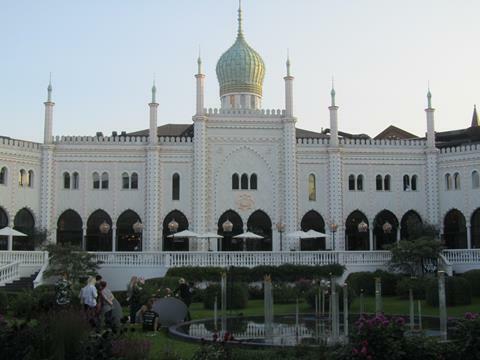 In the 21st century Copenhagen is one of Europe's most liberal and forward	thinking cities. For being so close to Scotland, Copenhagen took me a remarkably long time to get round to visiting. We went for a four night trip from Edinburgh, also taking in Gothenburg which is less than four hours	by train. It was a pleasantly warm week in August, and although it wasn't always brilliant sunshine,	the weather was a sight better than back home. The hotels were so busy that we couldn't get the	same one for both nights, so stayed in the First Hotel Vesterbro, followed by the Savoy, which did not live up to the pedigree of its name. Nyhavn is one of Copenhagen's picture postcard street/canals, with colourful Lego-style buildings, and	boats bobbing on the water. Indeed, you can buy reproduction Lego models of some of these buildings. 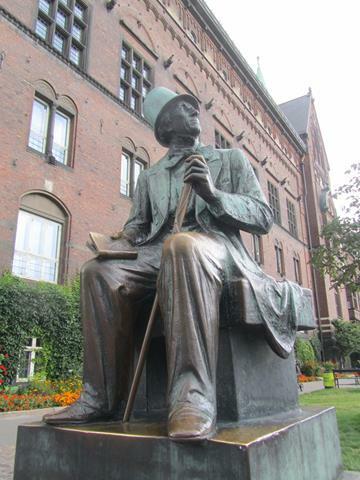 Hans Christian Andersen sits outside the City Hall, gazing above the Tivoli Garden. As well as The	Little Mermaid, H.C. Andersen's most famous works include The Emperor's New Clothes and The Ugly Duckling. He used to live at Nyhavn, in the picture above. 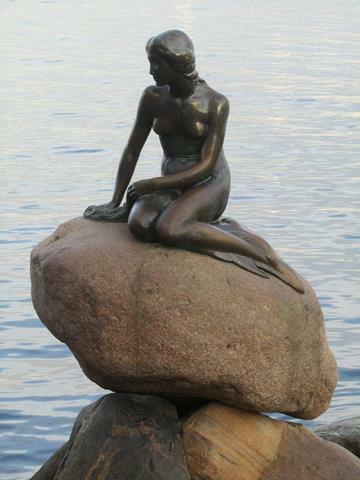 The Little Mermaid statue sits in Copenhagen harbour, quite some distance from the city centre but still	perfectly walkable. 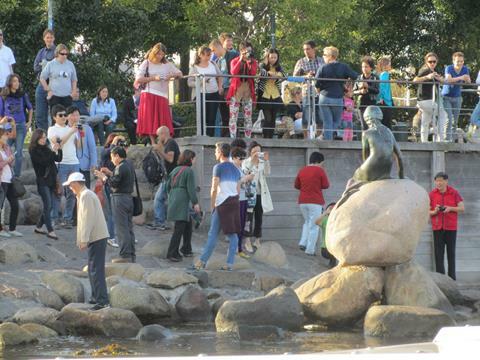 She is one of the most iconic sights of Denmark. When seen from the water on an afternoon boat cruise, The Little Mermaid doesn't appear quite so peaceful,	having to pose for the relentless crowds all day as she does. 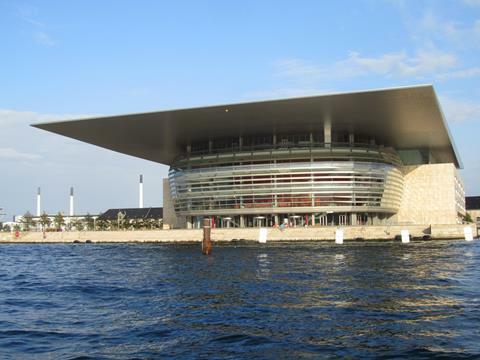 Copenhagen Opera House is across the harbour from The Little Mermaid, and was opened in 2004, around	the same time as the Valencia Opera House. The Danes know a thing or two about opera houses, with the Sydney Opera House having been designed by one of their sons. 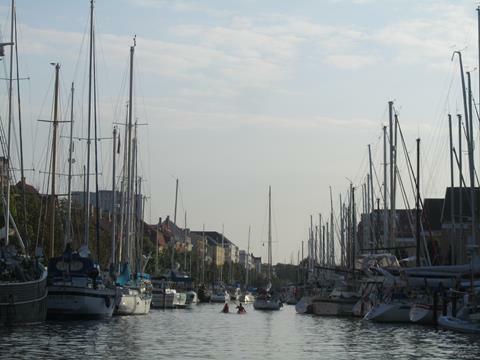 There are a number of canals crossing through the city, this is Christianshavans Kanal which we travelled	down as part of our boat trip around town. 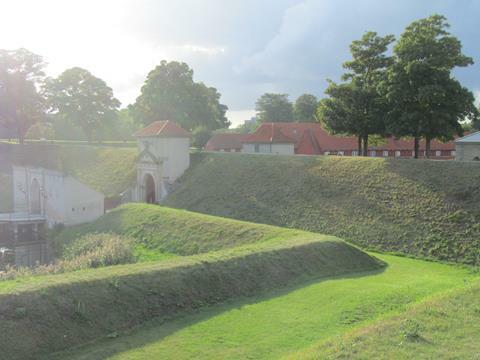 With a glance at the map of modern Copenhagen, the historical fortifications are still strongly apparent,	including the star-shaped Kastellet, the old Copenhagen Citadel. Not easy to photograph from the ground,	the ramparts are open to the public and were populated by runners and Segway-ers aplenty. Next to Kastellet stands the English St Albans Church, built in exactly the style you'd expect to see	in the UK. This photo is in fact a rotated reflection in the Kastellet moat, as it was so sunny and	the water was mirror smooth. 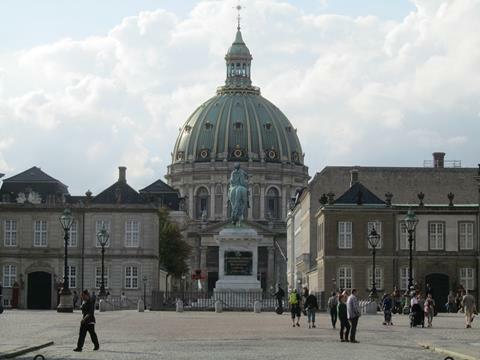 The Marble Church makes an imposing backdrop for Amalienborg, the square where the Danish royal family	lives. 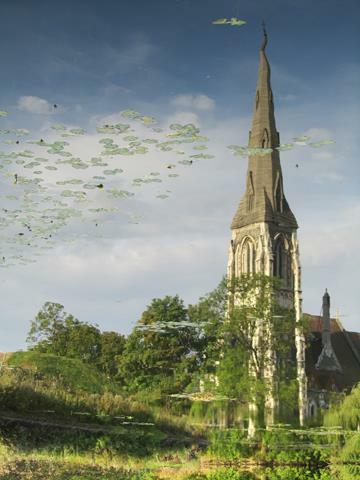 It is formally named Frederik's Church and was completed just before the turn of the 20th	century. 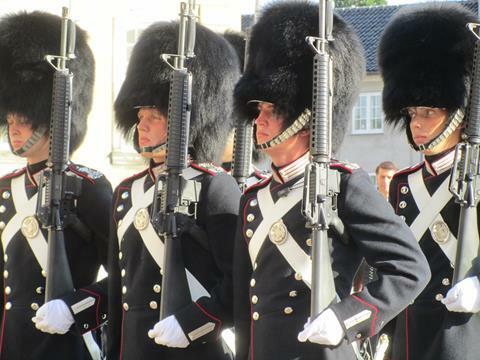 The Royal Guard at Amalienborg, with furry hats and pointy guns they're every bit as entertaining to	watch on the march as the guards in Buckingham Palace. These guys look pretty young. 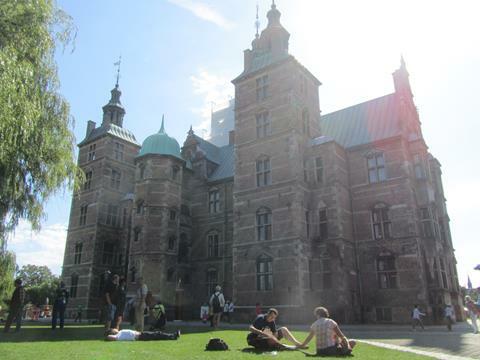 Rosenborg Slot is another of Copenhagen's castle-like establishments, but far more of a chateau than a military building. Used on occasion as a royal residence since the 1600s, it is now open to the public. Looking down into King's Garden from Rosenborg Slot. 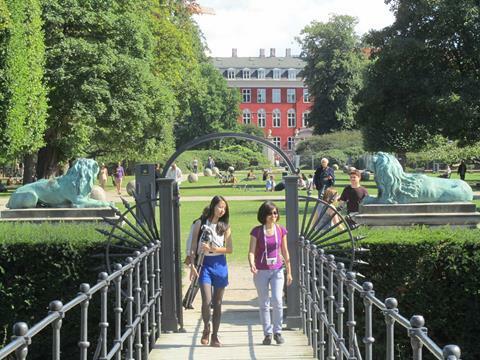 This is one of Copenhagen's many open green spaces,	filled with people in the August sunshine. 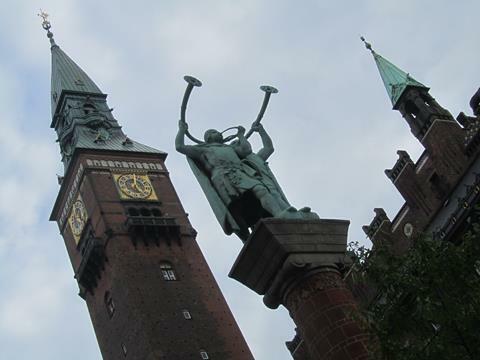 Copenhagen City Hall, complete with a strange trumpeting statue, The Lure Players. This building was	not altogether easy to photograph in a satisfactory way, but still looks pretty. 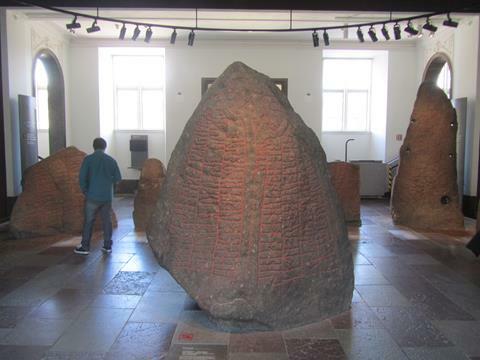 Ancient runes on display in the National Museum. They included a translation guide, and are actually	not altogether difficult to read, at least the examples that were given. Runes were used by Norway, Sweden and Denmark before the introduction of the Latin alphabet. 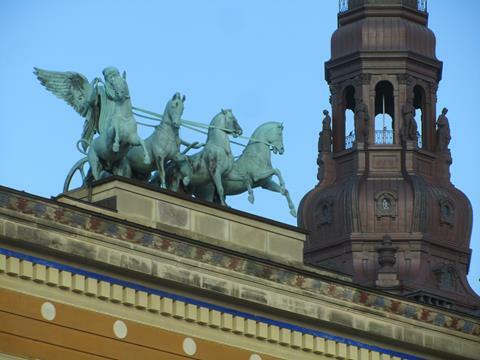 Thorvaldsen Museum on Slotsholmen is topped with an angel driving four horses, and the spire of Christiansborg	Palace stands in the background. 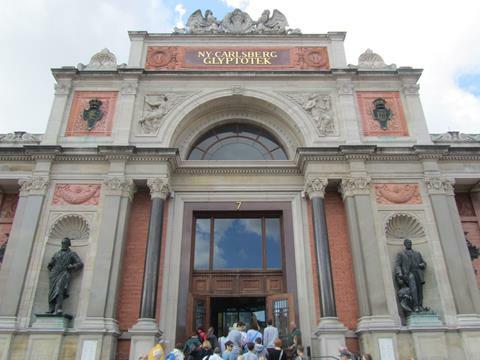 Ny Carlsberg Glyptotek is a museum of sculpture in the centre of town. Although at first glance you	wouldn't think it had much to do with the famous lager (if Carlsberg did museums) it was in fact built	for the art collection of Carl himself, after whom the beer was named. 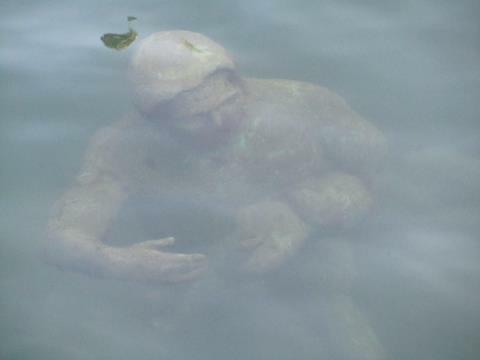 In the canal surrounding Slotsholmen is one of Copenhagen's more hidden attractions - the Merman and	his seven sons. The combination of rippling water and low angle light when I was there made it difficult	to photograph any more than one or two of them at a time. Copenhagen sports the world's longest pedestrianised street, the two-mile Str�get which runs from the	City Hall all the way to the Royal Theatre. 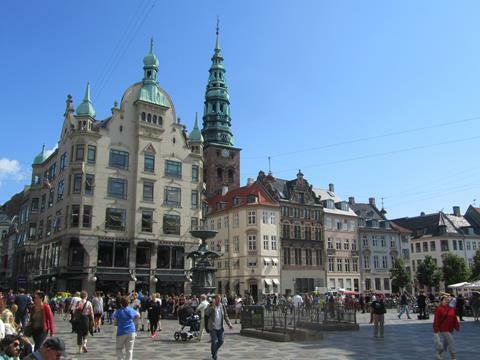 This is H�jbro Plads, seen from Amagertorv, the most central	squares in the city. No trip to Denmark would be complete without a visit to the Lego shop. 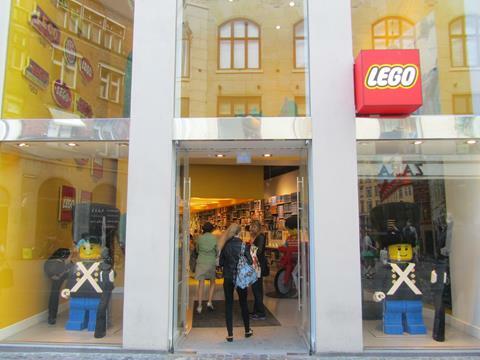 This is the main Lego store	in Copenhagen, on Str�get, which even featured a Lego pick-n-mix! 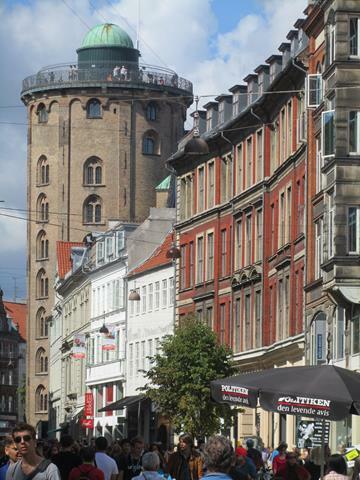 The Round Tower, or Rundet�rn in Danish, named such for obvious reasons, is part of the Trinititus Church	and was built as an observatory. Climbing up the spiral ramp inside takes you to the top for great	views across town. 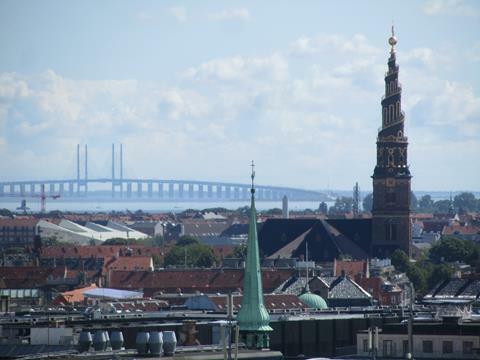 From the Round Tower you can see all the way to the Kattegat and the �resund Bridge which crosses over	to Sweden. The bridge is actually a combination bridge-tunnel, carrying road and rail traffic across	the strait for nearly 5 miles. The transition from underwater to overwater is at an artificial	island. 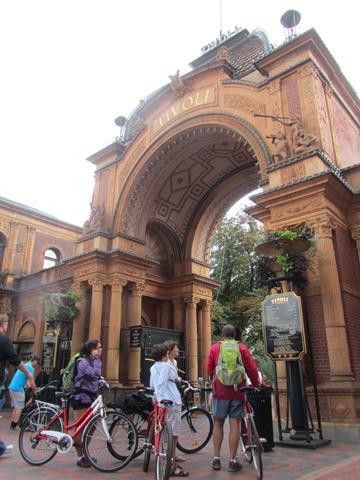 Tivoli Gardens is perhaps Copenhagen's most famous attraction, and is certainly one of its most fun! It's a complete amuseument park right in the centre of town, with rides, shows and restaurants galore. 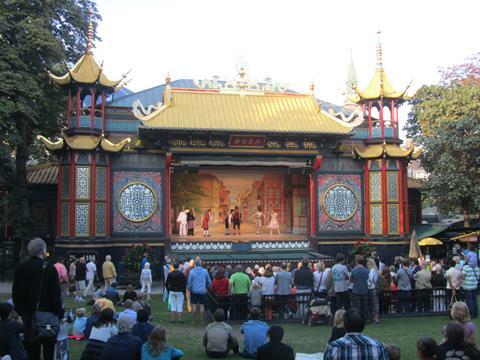 When we walked in we caught the end of a play on this Chinese style stage, the Pantomime Theatre. The Nimb Hotel is Moorish in style, although to me it looks more like the Indian-inspired Brighton Pavilion. It really is a hotel, and reportedly a pretty good one. 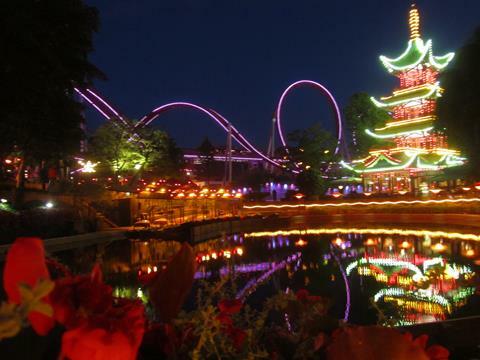 Dragon Boat Lake with a pagoda and roller-coaster illuminated in the background by night. There are	five roller coasters altogether!